There are two different procedures for opening a MIE file, depending on whether or not you have a pre-existing .tab file that references the MIE file. 3. Double click on the .tab file you want to open, or press the Open button to open the mie file. 2. Change directories to the one containing your .MIE image. 3. 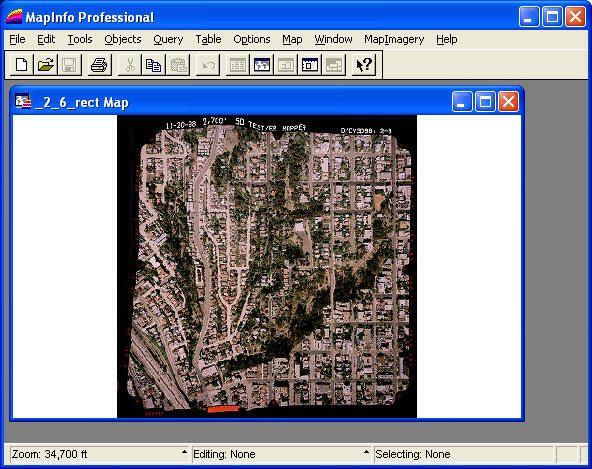 Change Files of Type: to point to Raster Image. (*.mie should appear as one of the items in brackets). 4. 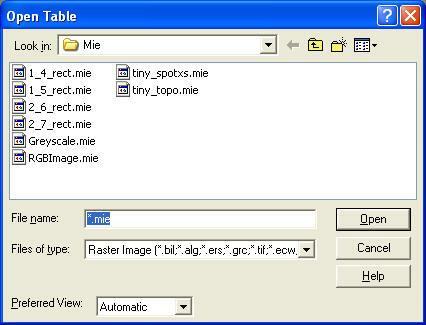 Type *.mie into the File Name field and press RETURN. You should now see a list of .mie files in the chosen directory. 5. Double click on the .mie file you want to open, or select the file name and press the Open button to choose the image you want to display. 6. You will now be presented with the following dialog. Choose display to just view the image, without geographic coordinates. 7. 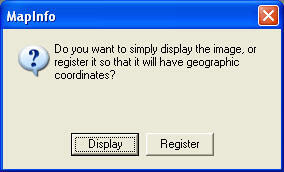 You should now see your MIE image inside a MapInfo Mapper as shown below.